We specialize in chemical soft wash cleaning of roofs and exterior surfaces. What are some of the biggest benefits of having your roof cleaned? Aesthetically it makes a major difference and it is immediate. Most homeowners are shocked at the difference. This is especially valuable when trying to sell a home. Obviously the first impression is important. When the first impression is, "I will need to replace the roof in a couple years", that has a big impact on the sale. After we clean a roof the the first impression will almost always be, "Great, it has a new roof." Also, roofs can have their service life shortened due to bacteria and algae growth. Composition asphalt shingles, the most common type of roof in this area, are susceptible to damage from algae, moss and lichen, and it's not just aesthetic. That is why insurance companies routinely threaten to cancel homeowners insurance if a roof is not clean. The truth is, our method of roof cleaning lasts for years. We guarantee from 2 to 4 years, but 5 to 8 can be expected. Can you briefly explain the main differences between the soft wash process and pressure washing? Traditional exterior cleaning contractors use high pressure, which removes surface growths and biological contaminants with brute force. Unfortunately this often causes damage, which we have seen countless times. This is the case even with well-meaning professional cleaning contractors. Manufacturers of the most common roof and exterior building products consistently warn against using pressure to clean their products. Sometimes even voiding the warranty. Chemical cleaning is a much gentler method that uses no more pressure than a garden hose. The results of soft washing, particularly on roofs and building exteriors, is by far superior - which is obvious in minutes. Having said that, pressure washing does have its place and is a time tested and valuable tool for professional cleaning contractors. Which type of cleaning is more effective for long-term results? Why? Chemical cleaning is far more effective and long lasting. We guarantee it. Pressure washing does not kill the bacteria, it simply removes a portion of what is visible and waters it. Obviously that is not the way to kill a plant. We have plenty of documented evidence to back up these statements. It is also noteworthy that the regrowth of the dark bacteria almost always shows the pattern of the pressure washer wand. Again, we have plenty of documented evidence of this. Is there something most people don't know about roof and exterior house cleaning that they should know? Yes, the cause of dirty and old looking roofs and exteriors is almost always bacterial, it is not dirt. A proper chemical cleaning makes an amazing difference that lasts for years. Filling out the contact form on our website, emailing direct to eric@pacificroofcleaning.com or calling 831 677-2313 or 831 212-1341. 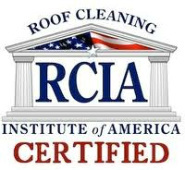 Our website is www.pacificroofcleaning.com.